Sunday Quaker silent worship was --not quite silent. One friend asked in prayer that the burden of the world he had taken on be lifted from him. I can so relate to that one! Studying the refugee situation and trying to understand the Islamic State had me really down! After silence, one friend sang "For the Beauty of the Earth", and another sang "The Battle is Over" in her sweet clear voice. It was very moving. During the silence I was gifted with several visions for new work. This is one of them. In my mind, I saw a woman snuggled in this Rainbow Quilt, a soft, comfy, beautiful quilt of indigo blue with rainbows along the sides. When I got home, I developed the idea further and looked up fabric I might use: A charmeuse silk or silk blend for the top; bamboo rayon, cotton velveteen, or quilters flannel for the bottom. 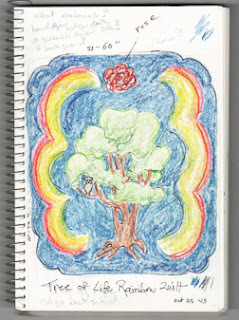 The rainbow, tree, and rose painted on silk and appliqued onto the top. I need to earn some money at the holiday bazaar and studio tour to buy the fabric, so not sure when this will be completed. I wonder who it is for?